Italy - Theatrical Show in Perugia to Promote Clitoraid! In occasion of Women's Day on the 10th of March, 11 magicians decided to dedicate a special show to help raise funds for Clitoraid, a non-profit association that is building a Hospital in Burkina Faso (West Africa) that will provide free surgery to FGM victims. 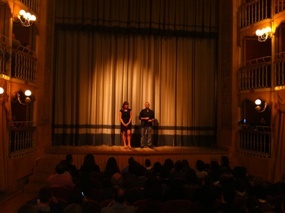 The show was organise in Torti theatre in Bevagna (near Perugia) and it turned out to be a wonderful evening! Thanks to local advertising and a few newspaper articles that were published to announce the event, the theatre was fully booked to its maximum capacity, that is 250 people. Imagine our surprise and joy! Marilena Sangiorgi, leader of the Clitoraid branch in Italy, opened the evening by explaining the purpose of Clitoraid and the progress the association has made so far. Recent articles have been published with details on the website . The show was a great success and at the end Andrea, the presenter, called Marilena on stage to hand her a transparent bag containing all the public donations collected during the evening, a grand total of 1,000€, a real magical moment! The Clitoraid team would like to thank all the people who donated to our cause, the wonderful team of magicians, our special friend Giovanni Ottaviani and also a huge Thank You to Andrea Paris, the professional magician who made the effort to organise all the details of the show, from advertising, direction, preparation, and everything else! When Magic happens everything is possible!